The 7th Long-Range World Muzzle-Loading Championships were held September 24-27 at Camp Butner, North Carolina. Shooters from seven nations competed at distances between 300 and 1,000 yards. Competitors employed percussion target rifles of 19th-century design (though many were modern reproductions). Typically between .40 and .50 caliber and weighing around fifteen pounds, these rifles represent the apogee of mid-1800s firearm technology. The World Muzzle-Loading Championships, held since 1972, is the highest level of target shooting with muzzle-loading arms. Guns used range from Japanese matchlock muskets, through the flintlocks of the American Revolution, to the percussion arms of the Civil War era. Individual competitions are held in eight rifle, four pistol, and two shotgun events. Original antique arms and modern replicas compete in separate classes. CLICK HERE for complete match results. American competitors excelled in the original-arms division of the matches. Firing 150-year-old antiques, Karl Kuehn took gold in the 1,000-yard match and silver in the 900-yard match, carrying him to triumph in the overall long-range aggregate and earning a bronze medal in the Grand Aggregate. Nor was Kuehn the only medalist. Al Roberts won the original division of the 600-yard match, while Mon Yee took bronze at 300 and 500 yards — scores which earned him bronze in the mid-range Agg as well. The Long-Range Muzzle-Loading World Championship was held under the auspices of the Muzzle-Loading Associations International Committee (MLAIC), the world governing body for black powder competition. The 8th World Long-Range Championship will be held in 2011, at the famed Bisley range in Great Britain. 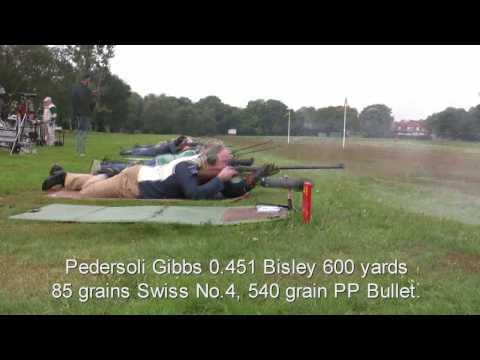 Shown below is a Pedersoli Gibbs target rifle at Bisley during the UK National Championships. Repro rifles like this won 10 gold medals at the 2007 World LR muzzle loading championships in South Africa. More information on long-range muzzle-loading is available at www.lrml.org and www.usimlt.org (USA Team website). Share the post "World Long-Range Muzzle-Loading Championships at Butner"
Hello; I am in possion of a pristine 1841-1852 competition/sharp shooting rifle. I am on a hunt for E.S. Johnson. His name is stamped twice on this rifle. He may be, or related to, the E.S. Johnson manufactuing company that was located in NYC. Any ideas? Leads to historic competition shooters?